This model was developed by IBM in 1960’s, When they developed a project called IMS (Information Management System). In this model data is always arranged in the form of a tree structure in different levels. 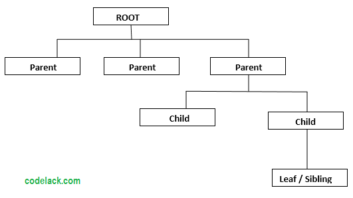 The top level can be called as root. The 2nd , 3rd, 4th Level can be called as parent, child and sibling levels respectively. To represent the data in DBMS we first identity an entity. i.e. whose data has to be managed. Anything which has attributes to get can called as entity. Because it is designed in one to many relationship a child can have only a single parent so, redundancy comes into picture because of data duplication. When we want to access the data in this model we need to travel from the root node step by step to the desired level, which will be time consuming. Only one person can share the database simultaneously. The first database that came into existence in a hierarchical model is IMS(information, management system ) from IBM.